U by Uniworld offers something completely different. 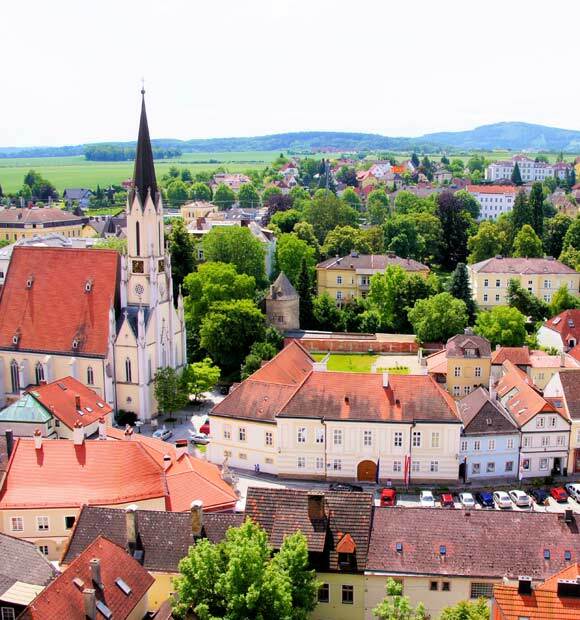 This is river cruising for the next generation, with voyages and river cruise ships designed specifically for millennials aged between 21 and 45. 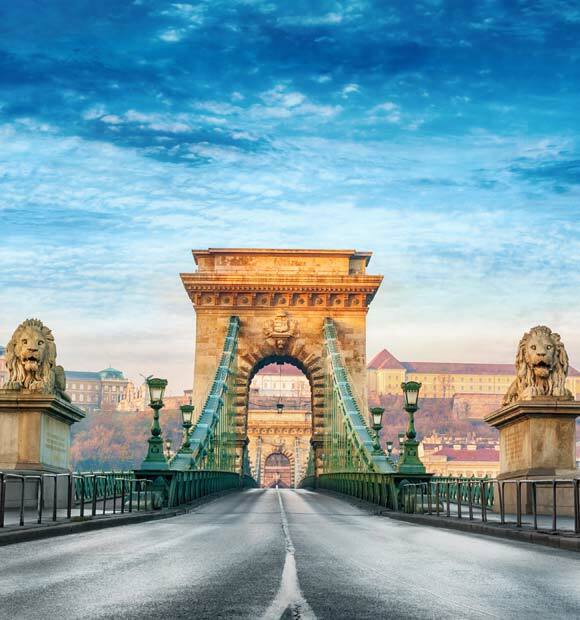 U by Uniworld launched its first preview river cruise in October 2017, and went public on the Rhine, Main, Danube and Seine rivers from in 2018. Both of the cruise line’s chic ships has a maximum capacity of just 120 passengers, meaning guests can sit back and enjoy authentic adventures underpinned by truly impeccable service. 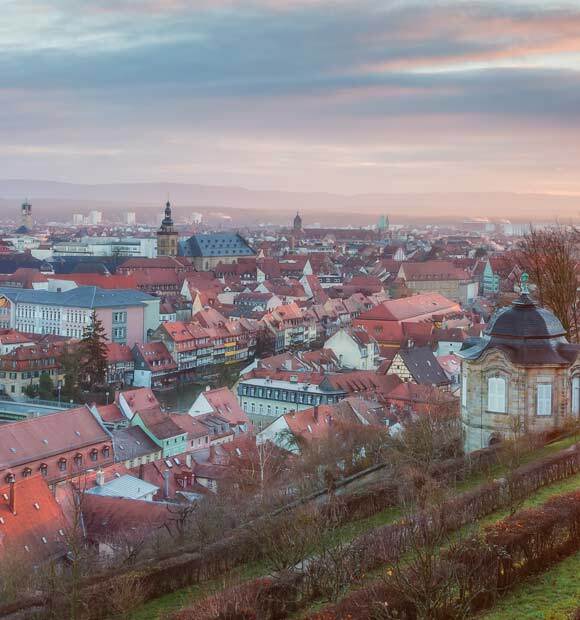 All accommodation on U by Uniworld’s river cruise ships features super-comfy Savoir mattresses, plenty of outlets with a variety of plugs (including USB ports), and Bluetooth speakers. Guests can lie in; listen to their favourite music while they get ready for cocktails in the on-board Ice Bar; and make sure they have enough phone charge to upload those jealousy-inducing Instagram snaps. Depending on the bedroom-grade you choose, you may also be treated to some little extras. Studio Triple bedrooms have adjustable mood lighting and three beds (perfect for friends); Studio bedrooms offer ample storage space; Balcony bedrooms boast spacious French balconies; Suites compliment French balconies with a desk, table and chairs; and all rooms have stunning waterfront views. U by Uniworld believes in authentic experiences both on-board and ashore. 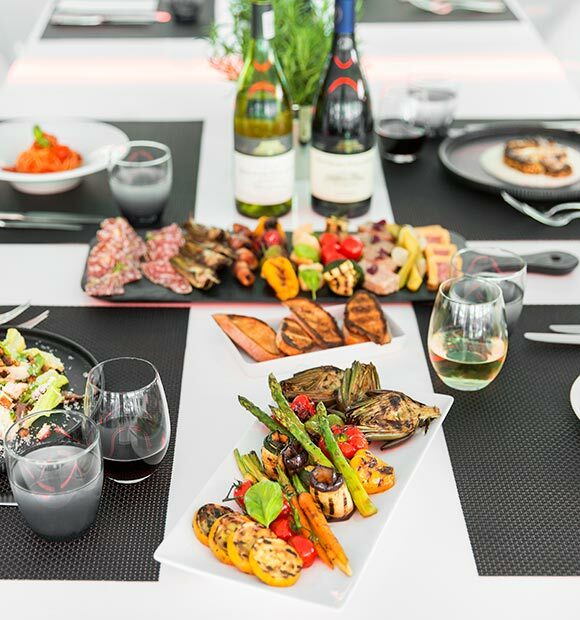 As a result, every dish you enjoy on your river cruise ship will be inspired by local fare and created using local produce. Enjoy vegan, vegetarian, organic, gluten-free and many more specialist options alongside juicy burgers and authentic street food. You can even take part in U by Uniworld’s Eatwith partnership, where you can share a home-cooked meal in the abode of a local U Host. 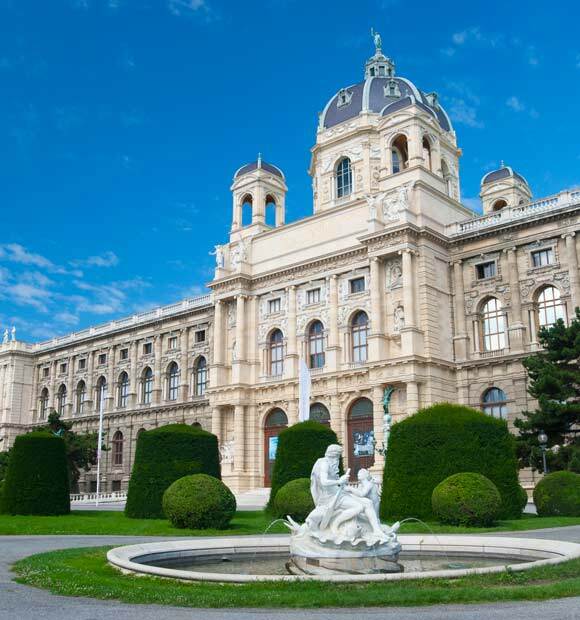 U by Uniworld currently operates two stunning river cruise ships: The B and The A. The B sails the Seine and was formerly Uniworld’s River Baroness, which has been transformed into a cool and quirky vessel made for cocktail parties and live DJ sets. Contemporary interiors are brought to life by filament lightbulbs and monochrome colour palettes complimented by splashes of vibrant colour. Join a yoga class on the Rooftop Lounge and enjoy cocktails created by an on-board mixologist in the Ice Bar. The A (formerly Uniworld’s River Ambassador) transports guests down the Rhine, Main and Danube rivers in the same kind of laid-back luxury as The B. Hit the gym or enjoy a hike with the on-board wellness coach, before winding down with a relaxing spa treatment or a catch-up with your fellow passengers in the U Lounge or Mugs café. With plans to launch Mekong river cruises on-board a brand new ship, the fun is only just beginning! U by Uniworld prides itself on immersive shore excursions planned around your schedule, with late-night and overnight stays in port and later excursion start times, so you can enjoy a much-needed lie in. Each itinerary is packed with opportunities to savour new flavours, immerse yourself in local culture and be wowed by the passing scenery. What you do is up to you! Enjoy one included shore excursion per day, and choose from a range of extra activities, excursions and events tailored to your travel personality. Rock climb in Swiss Franconia, taste Golden Age Cheese paired with beautiful wines in Amsterdam, and see Paris from historic rooftops high above the city. And if that doesn’t grab you, you can do your own thing, filling your social feeds with wanderlust-inspiring moments. Part of U by Uniworld’s initial fleet the ships, A and B are beautifully boutique and serve as your taxi, bar, favourite restaurant and yoga studio. The ships are aimed at 21-45 year olds looking for adventure and innovative river cruising, reaching 27 ports of call in six countries. 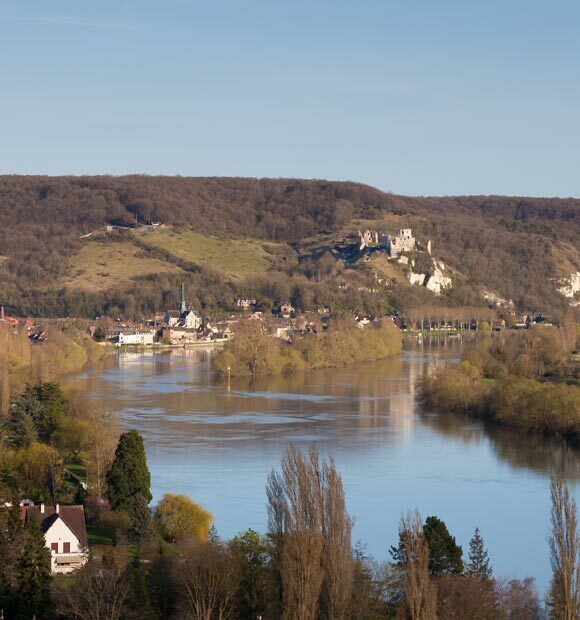 A solely cruises along the Rhine, Main and Danube rivers – visiting ports of Germany, France and Hungary, flowing through the Netherlands and Central Europe. She boasts a sleek and sophisticated in design, including on-board amenities such as the signature communal dining area, Dine, with cuisine inspired by local ports. Spend time on the ship’s rooftop deck as you pass scenic landscapes, perfect for a relaxing drink with fellow passengers or a morning yoga class. 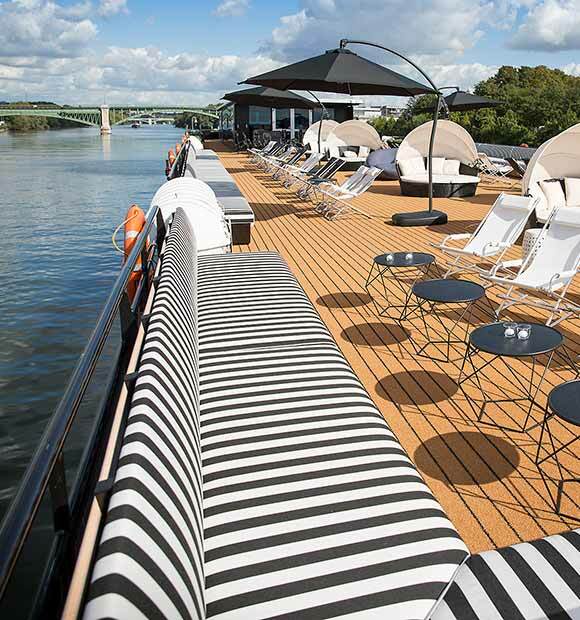 B cruises down France’s Seine river, showcasing stunning Parisian influence and chic interiors. Enjoy her Ice Bar for signature U cocktails and craft beers, where the walls are on hydraulics for ease sailing under bridges. Or relax into the ship’s U Lounge, the main hub of the ship, for a paint and wine class or after-dinner drinks with your cruising party. 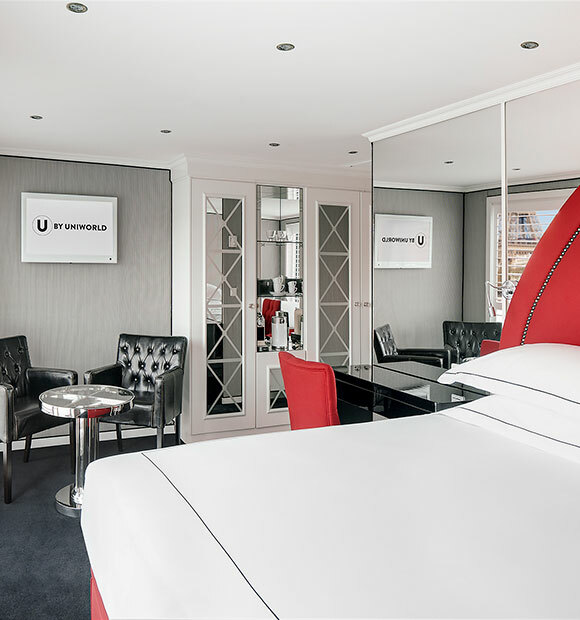 With such a stylish design and innovative view of river cruising, U by Uniworld is everything you can find in a boutique hotel, yet you sail some of the world’s greatest European rivers. Both ships offer fantastic on-board facilities, perfect for navigating the rivers in true style and complete comfort.